So what's up next? Graduation party, anniversary party, retirement party, engagement party, baby shower or family reunion? Planning, organizing and managing your upcoming family event or any other event can be a challenge especially when it comes to streamlining needed tools and apps so that everything you need to is at your fingertips. 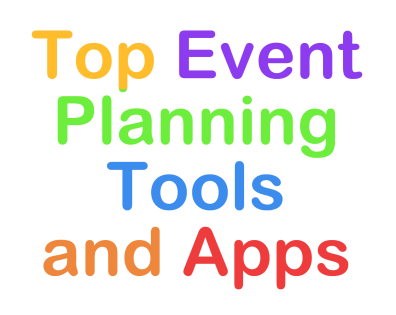 This list will help you get better organized by adding the top event planning tools and apps to your devices reunion planning page. Getting the word out about fees can be a challenge. Collecting the fees can be even more challenging. But it doesn't have to be. After listing activities mention fees according to household and ages. Make it easy for members to forward fees by setting up ticket payments on your family reunion website. All households making up the clan should register for a number of reasons. First and foremost to make sure no one is overlooked. Third, to document all contact information and get the facts as to the total number of family members per household. Sending invitations and keeping up with responses can be a tedious task. Information regarding the details of the event can motivate greater participate and build anticipation. But how do you get all that out to invitees? Make use of online invitation apps. Apps that allow you to provide details of the event are essential. This will also enable family members to do better planning and pack exactly what will be needed to enjoy the occasion. All communications including invitations should include contact us information. This provisional link should be easily accessed when sending emails or add the url on post mail. When designing a family reunion website put the contact us link in a prominent location on the side panel or across the running head of the page. Message boards have been a prominent online feature for decades. Millions of professionals are still using them to relay information to specialized groups. Family reunion members find them an invaluable tool to keep all progressively informed from one stage to the next. Making a message board available from your family reunion website can be a great way of bringing family back together. It's an effective forum for discussing event planning issues, making periodic announcements, keeping folks up-to-date and documenting event activity ideas and details. Guest books or registration books and forms should be provided on location. Online guestbooks featured on the family reunion website give members an opportunity to post a greeting on behalf of the household and make a statement. A family directory is a great way to list contact information along with any special service, business or profession that would be of value to the family community. Take the time to answer questions family members have about the event and post it so all can benefit from the answers. This can be featured on the family reunion website as well. Everyone likes looking at photos. Every loves looking at family photos. It's a great way to watch the family grow and fondly look back at good times. Reserve a space for photos in your newsletter, the family reunion keepsake memory booklet and as a permanent feature on the family website. Folks will keep coming back for more. New feeds provide a meaning of posting the latest news about special events as they happen. Post news clips in the family newsletter. Provide news feed on the family reunion website. Calendars are a perfect way to post upcoming events such as wedding, engagement parties, showers, graduation parties and more. This feature can be provided in newsletters, the family reunion keepsake memory book and be a permanent fixture on the family reunion website. Use the survey feature to keep track of preferences regarding the dates, locations and activities of the reunion event. Use the family reunion event planning app to post surveys via your social network page. Remember to provide a survey module on your reunion website. Family polls are both fun to take and very informative to committee event planners. Take polls to determine favorite activities, locations and events. Review poll results at committee meetings before making final decisions. Post more interesting poll results in the family newsletter and on the family reunion website. Feature family businesses and empower the financial stability of the family. Reserve a space in the family newsletter, family reunion keepsake booklet and the family reunion website. Hold online auctions to raise ,money for causes related to the family and the reunion event. A great way to access templates and apps for all your family event planning needs is Fimark's Family Reunion Planner Social web app. It has everything you need including the apps and tools mentioned above to plan, organize and manage a memorable family reunion. How To Stop The Madness! Have you've ever gotten so bogged down with work that you seemed trapped in an occupational maze? Slaving for the man and unforeseen occurrences can easily result in early burnout. Often family bonds go neglected. Getting back on track may be difficult and even when you put forth some effort to get closer to sons and daughters, mom and dad a perfunctory routine may not do much to keep family bonds strong and meaningful. Just stop the madness. Get out of the rat race. The days are getting longer and warmer. The sky is bluer. The air is fresher. The birds are chirping and the flowers are in bloom. It's time to think about sharing in some cool activities for spring. This season plan to get out of the house and do something fun with your family. Steer in the direction of rediscovering and celebrating good old reliable family values. Start by gathering the family at the dinner table. Fix and serve their favorite healthy meal. Now sit down and chow down. Ask them to brain storm some exciting activities they would like to do this spring and summer. Make definite plans to make it happen. Before you know it they will be back in your arms again. Family reunions are not just a one time event experience. the planning process involves planning several events that often engage the family for months at a time and that's the genius behind reunions. Why not plan your next family reunion now. To get inspired check out my family reunion planning app. You'll be amazed at the possibilities. As we have said so many times, we aspire to inspire you. We appreciate hearing the many positive reviews from satisfied family reunion planner web app users like Angie Hawkins. I just want to say thank you so much. The Reunion Planner is awesome. I know it has been 7 years and it's still a wonderful package. Sincerely, Angie Hawkins"
Thank you Angie. We hope you continue to get the most out of Fimark's Family Reunion Planner web app, ebook and paperback book for years to come. Thanks to you we will continue to aspire to inspire you to plan the most memorable family reunion planner ever. Access the family reunion planner web app here.